In the previous Creating Health sessions, Palmer Kippola discussed how to heal the environmental triggers of MS – detoxing, reducing inflammatory foods, and incorporating pre- and probiotics for gut health. 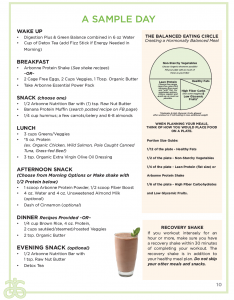 In this month’s presentation, Kim Mylls, of Arbonne International, gives us an example of a meal plan that helps include them all. Focus on eating organic, no GMO foods, free of preservatives, additives, pesticides, hormones, antibiotics, artificial flavors and all other toxins. As well as reducing toxins, organic fruits and vegetables contain up to 40% more antioxidants than those conventionally grown. Eat whole foods. Anything a caveman would eat! Due to the overabundance of prepackaged and fast food, many people today are overweight yet malnourished. They carry toxic fat while their bodies are starving for real nutrition. This condition can be reversed by eating whole foods and supplementing with nutrients to fill in possible deficiencies created by mineral deficient farm soils. To help increase your nutritional intake, add an organic green superfood powder into your meal plan, such as in your morning drink or a protein smoothie. This powder will deliver an abundance of fruits and veggies rich in phytonutrients & antioxidants and support GI health. To work on removing inflammation, remove possible allergenic foods like gluten, dairy, soy and processed sugars. If you cringe at the thought of removing a particular food, chances are, you are allergic to it. Generally speaking, the food you crave is the food that’s killing you. Support your intestinal health with a prebiotic, probiotic and digestive enzyme that support the intestinal wall, often damaged by allergenic foods. Probiotics scrub away yeast overgrowth in the lower GI and reestablish friendly bacteria. For best results take them in the morning on an empty stomach. One easy way to replace gluten, dairy, and soy, is to incorporate vegan protein shakes into your diet made from pea, cranberry, and rice (not whey). They are loaded with essential vitamins and minerals. Drinking meals are easier on digestion and allow your body to have the energy for detoxification. 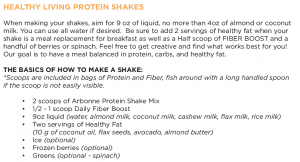 These shakes can replace one to two meals a day and taken after a workout. Half of a shake makes a great snack. Eat low glycemic index foods. The lower the rating, the more gradual the infusion of sugars into the bloodstream and the more balances the blood sugar. Soluble fiber is a great way to feel satisfied longer as well as balance blood sugar and reduces cholesterol. It acts as a sponge for toxins in the colon. The recommended daily amount of fiber is 24 grams. Soluble fibers can be added to foods, protein shakes, or drinks once or twice a day. It is important to support the body’s four elimination pathways – the liver, kidneys, intestines and your largest detoxifying organ, your skin. If toxins enter your body faster than they are removed, you will experience signs of toxicity. If, on the other hand, you give your body the support it needs to eliminate these toxins, it will perform optimally. Drinking one to two cups of herbal detox tea a day assists the daily cleansing of the liver and kidneys by helping the body to filter and clear toxins. 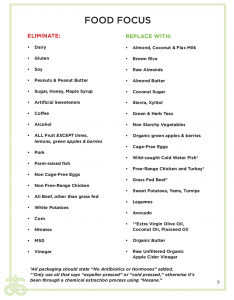 Additionally doing a 7-day cleanse during the 3rd week of following this meal plan helps cleanse and detoxify the system and support the liver, kidneys, and gastrointestinal (GI) tract. Arbonne’s whole food nutritional line can assist you in all five areas. 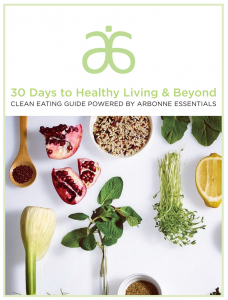 If you would like support in making the changes to your diet, consider joining Arbonne’s Program “The 30 Days to Healthy Living & Beyond” for less than $10 a day (includes the nutritional line, coaching, a Facebook support group and education, recipes and shopping lists). Call Kim Mylls at 602.432.4940 for more information and to join the program. The information provided here is presented solely for informational purposes so that you may learn more about the subject. Nothing contained in this program or meal plan is intended to constitute, nor should it be considered, medical advice or to serve as a substitute for the advice of a physician or other qualified healthcare provider. Always consult your doctor or physician before you begin any diet program.